It’s always about their defense as the Kansas City Chiefs roll on with their perfect start to the NFL season, but a little help from the officials certainly didn’t hurt as they got past the tough as nails Tennessee Titans, as Alex Smith slowly converts into the frustrating quarterback of old, which is something Andy Reid has to address and fast. On the drive that led to the Chiefs regaining the lead in the fourth quarter the officials blew it big time by once again paying the wrong kind of attention to the league’s call to protect the quarterback, which does seem like a sad joke at times, making it almost impossible for defensive players to do their job without being afraid for being penalized foolishly. 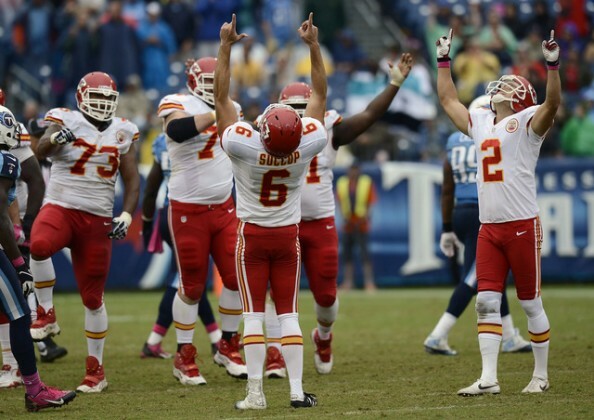 The Chiefs were on the Titans 44, with 3rd and 5. Alex Smith scrambled to the right sideline, and as he was going out of bounds, Moise Fokou helped him leave the field with a slight nudge with his shoulder. This wasn’t some late hit meant to hurt Smith, but only a precaution, a necessary one for defenses, who can’t really know if a quarterback is going to take advantage of the soft rules by heading out of bounds and then change his mind when he sees an open field in front of him. Instead of a 4th-and-3 with the Titans still in the lead, the Chiefs got a new set of downs, leading to a Jamaal Charles touchdown, and the eventual 26-17 win by the Chiefs, improving to 5-0 after going 2-14 last season. Not for the first time this season, it seems team benefit from the referees being afraid of a quarterback injury hanging over their heads, making them overreact to situations which are by no way wrong or illegal. 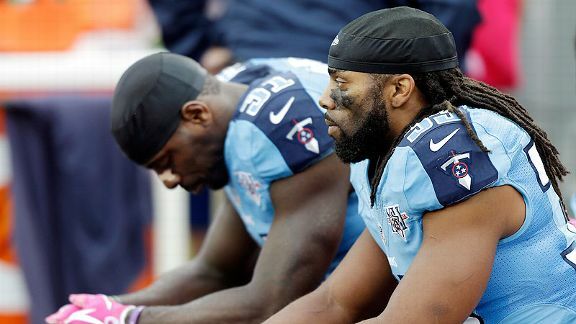 But while the Titans hold themselves from lashing out at the officials, the Chiefs have plenty of things to be happy about. The sacking tandem of Justin Houston and Tamba Hali, by far the best in the league right now, picked up two more sacks, while the Chiefs intercepted Ryan Fitzpatrick twice. Fitzpatrick was in charge of both Titans touchdowns – throwing one to Chris Johnson and running for one himself, but the Chiefs once again had a strong defensive performance, keeping the Titans at 339 yards of offense and making the most of the three turnovers they forced. He was 0-for-8 with an interception on passes traveling 15 or more yards downfield , which makes sense as the Chiefs are the fourth best team in the NFL against such throws. The Chiefs had their own mistakes to make up for, as Alex Smith threw an interception but not touchdown, and is starting to lose some confidence, esepcially against a team like the Titans, who sacked him only twice but had plenty of chances to put him under pressure, which isn’t something he deals with very well. We are 5-0, and we’re not ashamed of that. e also know that we’ve got a ton of room to improve and it’s important that we continue to do that. Even if the Chiefs aren’t “really” a 5-0 team, they haven’t stolen anything from anyone. They got one bad call from officials to help them, but the rest has been all about the confidence Andy Reid is giving them from the sidelines, and the defense flourishing, possibly being the best in the league right now.